It's one thing to learn to curtsy properly. It's quite another to learn to curtsy and throw a knife at the same time. Welcome to Finishing School. Fourteen-year-old Sophronia is a great trial to her poor mother. Sophronia is more interested in dismantling clocks and climbing trees than proper manners - and the family can only hope that company never sees her atrocious curtsy. Mrs. Temminnick is desperate for her daughter to become a proper lady. So she enrolls Sophronia in Mademoiselle Geraldine's Finishing Academy for Young Ladies of Quality. But Sophronia soon realizes the school is not quite what her mother might have hoped. At Mademoiselle Geraldine's, young ladies learn to finish...everything. 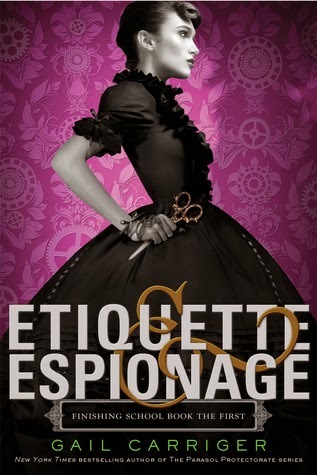 Certainly, they learn the fine arts of dance, dress, and etiquette, but the also learn to deal out death, diversion, and espionage - in the politest possible ways, of course. Sophronia and her friends are in for a rousing first year's education. So a friend on Goodreads read this and seemed to enjoy it so I added it to my list. I also added it to The Trucker's niece's Xmas Pressie ... so I wanted to read it beforehand. I was not disappointed. I thought it was a great girly YA book and I'm looking forward to reading the next installment. You know when after you've finished reading a book and every time you think about getting your Kindle to read some more you're a little disappointed cause it's already finished and you're actually reading something completely different now. This book was like that for me. This is definitely going on my list of books to buy this year! Sounds perfect for my Megan and I'm sure I'll love it, too.